Wolfgang Amadeus Mozart only wrote five concertos for the violin, and all of them before his 20th birthday. 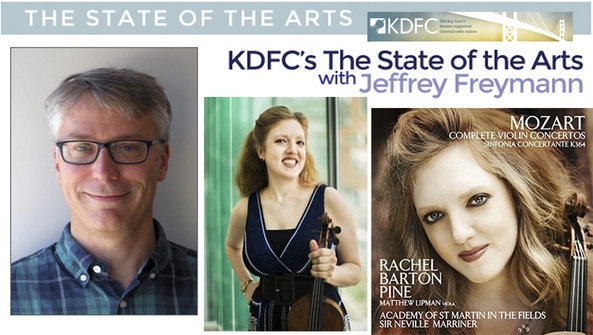 Rachel Barton Pine says they're each distinctive and brilliant in their own way. She's just released a new double CD of the complete set in time for this year's birthday (plus the Sinfonia Concertante) with Sir Neville Marriner and the Academy of St. Martin in the Fields. Rachel Barton Pine was inspired to record the set after performing a marathon concert of all of them in 2011 (three weeks after the birth of her first child!). It was hearing the cycle together that helped her see how each of the concertos are distinct. "I don't believe in doing marathon concerts for their own sake… in other words, the audience isn't there to just see if I can get through it – that's not the point. But whether I do the six Bach sonatas and partitas or the 24 Paganini caprices or whatever it is in a single evening, it's really about the musical journey, and hearing each of these great works in the context of its fellows gives you insights that you would have never heard if you just experienced them in isolation... If I play them each like 'nice Mozart' and do that five times, it's going to be a bit boring, like the same thing over and over again. So I needed to define for myself what makes number 3 unique, and different from number 4 and from number 5?" She says while the 5th is the one she would want to analyze and show respect to, the third is more of a friend. "There's something about number 3, it just has a personal feel, a friendliness to it. It's not up on a pedestal, but it's like your good friend, that you're hanging out with. It just puts a smile on my face."